Posted on October 24, 2012	by Katy K.
Victricia Malicia, Book-Loving Buccaneer. Written by Carrie Clickard. Illustrated by Mark Meyers. 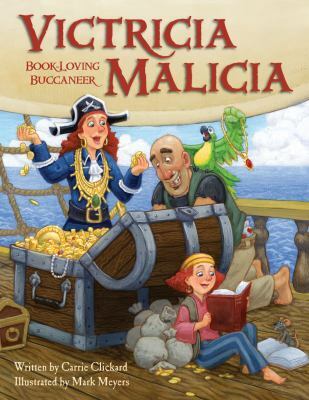 Victricia Malicia is a young pirate girl whose family members have all been pirates for generations. Born on ship and taught pirate ways, everyone expects her to grow up to be a pirate. But Victricia Malicia loves books and dry land. Can she find a new life for herself and still keep the respect of her pirate parents and peers? Only if she can show them that she’s still capable on board ship and find a way for her life on land to be relevant to them. It’s just a little bit odd in concept, as the book looks like it’s meant for young pirate fans, who might wonder why Victricia would want to give up life as a pirate. It’s still a funny story told in bouncy rhyme with bright, cartoony acrylic illustrations that will charm preschoolers and up. A Pirate’s Guide to First Grade by James Preller. This entry was posted in Books and tagged picture books, pirates. Bookmark the permalink.